ADHD 101: What is ADHD? 35: ADHD 101: What is ADHD? What is ADHD, really? 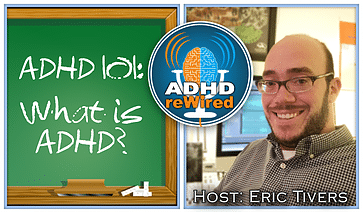 In a bonus episode, host Eric Tivers discusses, via analogies and examples, the reality of ADHD. Breaking it down into its separate categories, Eric explains the different standardized presentations of ADHD along with their identifying symptoms. If you or others you know are looking for an introduction to ADHD as a technical topic, this is an ideal place to start. The model of the US government we learn of in school is fairly simplistic, consisting of a description of the three branches and the process of passing a law. In reality, though, there are many other factors at play. The Diagnostic and Statistical Manual of Mental Disorders, 5th Edition (DSM-5) provides an accurate technical description, yet doesn’t tell the whole story of what ADHD really is. According to the DSM, in order to have ADHD someone must have five out of nine symptoms if they are an adult, and six out of nine if they are a child. There are a total of eighteen symptoms, with half pertaining to the inattentive type and half to pertaining to the hyperactivity type. Note: Symptoms must be present for at least six months and have existed during one’s childhood. New DSM revisions specify an arbitrary age of twelve years old. The symptoms must cause, and have caused, impairment and be present in multiple settings (school, home, social, etc.). At least six of nine symptoms must be present to meet the standard for a child to have ADHD, and at least five must be present for the same for an adult. An official diagnosis should always be made by a trained clinician. Often loses things: school materials, pencils, books, tools, wallets, keys, paperwork, eyeglasses, cell phone, etc. Is forgetful in daily activities: doing chores, running errands, returning calls, paying bills, keeping appointments, etc. Despite being established in the DSM-5, these definitions and symptoms are still being described in terms of behavioral characteristics. There are differences in group study in the realm of brain scans. For instance, the SPECT Scans advertised by Dr. Amen are not considered diagnostic in effect.